This is one way Hindus think of God. 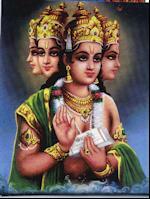 It is the God Brahma. Hindus follow the religion Hinduism. Hinduism began in India, but it is now practised all over the world. It is a world wide religion. Hindus believe in God. However, Hindus are allowed to choose what they think God is like. God can be a male or female form. The important thing is that Hindus love God. Hindus worship in a temple. Hindu homes have a shrine where families worship at home. Hindus can worship at any time and will choose a peaceful time in their lives to do this. Hindus put a picture of the god they are worshipping on a decorated altar. They often sprinkle water around the altar. Hindus sometimes offer flowers during worship. Fruit and food may be cooked and offered to God. After the worship, this food becomes holy and is called prashad. The family then eats this food at a special meal. Hindus light candles. Incense is burnt. Bells may be rung. Sacred scriptures are read, songs are sung and prayers are said. Sometimes a red mark is made on the forehead with red powder. Hindus believe temples are the homes of God on earth. Hindus can go to the temple at any time to worship. Hindus remove their shoes before entering the temple. When Hindus worship at the temple they do many of the things they do wehn they worship at home. Hindus may clap to tell the God they worship that they are in the temple. Temples have small shrines in their side walls. Hindus respect all life. Hindus would not harm any living creature because they believe in reincarnation or when they die they will be reborn. Hindus believe they can be born as an animal or a person. Hindus believe they are reborn many times before they reach karma. Karma is like the Christian ideal of Heaven. Hindus celebrate many festivals. Diwali is a famous Hindu festival. At Diwali people light lots of lamps, visit relations, have feasts and firework displays.